Doha - In previous years, the name 'Arjen Robben' was synonymous with the winger's skill, pace and breathtaking goals. In recent months, however, all that springs to mind is his anguish from the penalty spot and a perpetual injury-induced absence from first-team duties. Even without Robben, Bayern have been all-conquering this season. A record start to the Bundesliga campaign with 44 goals scored and just seven conceded saw them crowned Herbstmeister with three games to spare. They now sit nine-points clear at the top of the table, having also progressed to the last 16 of the DFB Cup and the UEFA Champions League, where mouth-watering ties against Dortmund and Arsenal await them respectively. Yet Robben has been little more than a spectator. The winger has made just five appearances in the Bundesliga this term, featuring twice in the Champions League and twice in the DFB Cup against Jahn Regensburg and 1. FC Kaiserslautern. By contrast, Thomas Müller has nine goals and five assists in the Bundesliga alone, while Xherdan Shaqiri's stock has risen dramatically thanks to a string of impressive performances in the lead up to the winter break. Their form, particularly that of Müller, begs the obvious question, can Robben force his way back into the first team? For a player that almost single-handedly delivered a domestic double to the Allianz Arena faithful, fired the club to the Champions League final and was named Player of the Year in his first season, there is no doubting his talent or ability to do so. The doubt arises in relation to his fitness. Robben is just a few weeks short of his 29th birthday but has already suffered five separate injuries this season alone and 18 in total since joining the club from Real Madrid CF in 2009. He has been a Dutch international since 2003, but has made fewer appearances than one might expect - just 63, scoring 17 goals - which provides further evidence of his blighted injury record. By comparison, Bastian Schweinsteiger has almost a century of caps for Germany despite making his international debut a year later. Hope springs eternal, though, for the man who came through the youth ranks at FC Groningen. Franck Ribery, now aged 29, has suffered similar frustrations with injuries since arriving in Bavaria, but is now in the form of his life. 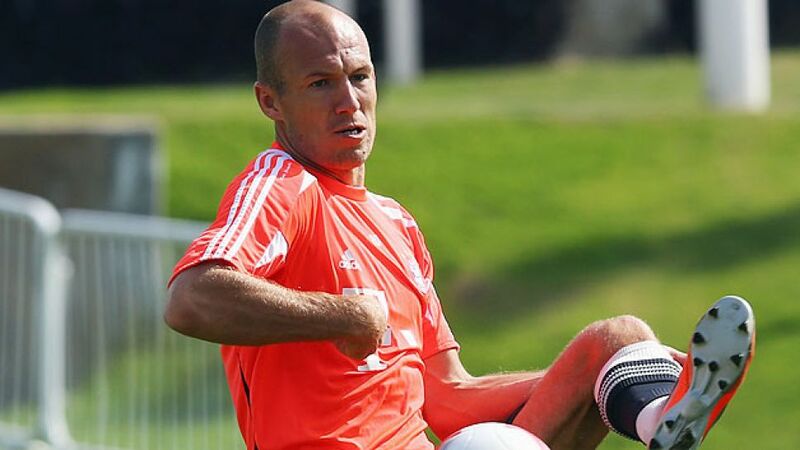 Furthermore, Robben has proven extremely productive at Bayern's winter training camp in Doha, Qatar, and is set to be fully fit for the Bundesliga's resumption on 18 January. That Bayern are competing on three fronts also means Robben is sure to feature if fit. Müller may be first choice in the league, with Shaqiri knocking on the door, but as each campaign nears its conclusion, players with Robben's experience are invaluable commodities. In the Champions League especially, he is still one of Bayern's most fearsome weapons, one of the most likely to turn a European tie on its head and someone with a point to prove after missing a penalty in last season's final. There is no doubt that he's still hungry for more and two trophyless seasons will have hurt Robben more than anyone at the club. As always the doubts will remain over his ability to stay fit, but if he can, it serves as a boost for Bayern and a warning for the rest of Europe.